This is a superb photo of the Rocky statue, at the base of the steps, with the incredible backdrop of the Philadelphia Museum of Art, in the background. 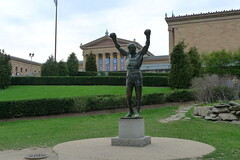 Visiting the Rocky statue – made famous by the series of enormously popular Rocky films, made by the native Philadelphian actor, Sylvester Stallone – is one of the most popular things to do in Philadelphia. It is located at the base of the steps of the Philadelphia Museum of Art - also known as the "Rocky steps". And either before or after their photo with the Rocky statue – unveiled for Rocky III in 1982 – visitors also race up the steps, just as Rocky Balboa famously did in the original Rocky in 1976. Of course, this page is still under construction. Please be patient, and check back for more content. The best way of reaching the Rocky statue is by mass transit. Your two main options are the purple Phlash trolley - when in season - and, of course, SEPTA - which offers a variety of options to get there. The Phlash will take you directly to the Philadelphia Museum of Art, so it's far and away the best bet. It runs all through Center City, so just find the nearest Phlash stop and wait for it. However, it only runs during the heavy visitor season, between May 1 and October 31, and it also stops running around 5:30 - 6 PM or so. So if you're in town during the six months of its operation, and it's during the day, go for it. If you are coming from elsewhere in Center City, you can take the Blue Line / Market-Frankford Line/ "the el" - which are all the same thing, just different names for one line - to its 15th Street Station. You disembark there at 15th and Market Streets. Walk one block to 15th and JFK, and wait for the 38 bus. You can also take the Broad Street Subway / Orange Line to its City Hall station, which is located at the intersection of Broad and Market Streets. From there, just walk two blocks to 15th and JFK, and wait for the 38 bus. However, if you are coming from more distant neighborhoods, or from the suburbs in Pennsylvania or New Jersey, you will need to take SEPTA Regional Rail service, to reach Center City. Nearly every inbound SEPTA Regional Rail train will stop at Suburban Station - located at 16th Street and John F. Kennedy Boulevard. Just disembark there, and walk one block to 15th and JFK, to take the 38 bus, or the Phlash, which also has a stop nearby. This is a picture of the Rocky statue, in front of the old Spectrum in South Philadelphia - where it had spent most of its existence. Eventually, it was moved to its current location outside the Philadelphia Museum of Art. For a larger view, just click directly on the photo. 1976 - The original Rocky film is released. 1982 - Rocky III is released. In one scene, Rocky is honored at a formal ceremony, by having the new Rocky statue placed at the top of the Art Museum's steps, where he is confronted by the film's villain, Clubber Lang, played by Mr. T.
After the scene is filmed, there are some calls for it to stay there (the top of the steps, not off to the side, the way it is today) permanently, but Museum of Art officials - wisely - refuse to permit it to stay at the top, because it would wreck the appearance of the Museum. 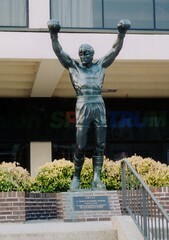 As a result, the statue is relegated to the Sports Complex in South Philadelphia, in front of the entrance of the old Philadelphia Spectrum - the site of one of the fight scenes in the movie - the photo of which you can see, above. 1990 - During filming of Rocky V, the statue is once more temporarily moved to the top of the steps of the Museum of Art, for the filming of one scene. It renews the public debate over where the statue should permanently reside. Summer 2006 - The Museum of Art finally relents, and permit the statue to be placed off to the side of the steps, where you can see it today. If you'd like to leave the Rocky statue, and return to the Home Page of Enjoying Philadelphia, please click here.